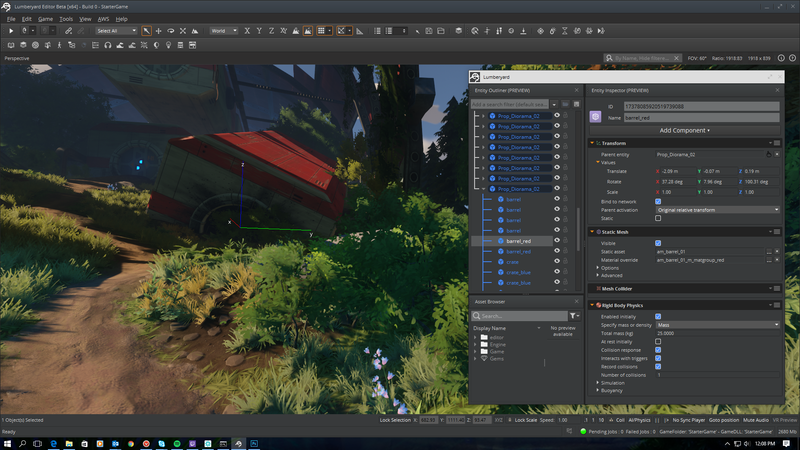 Today, we’re excited to announce the availability of Lumberyard Beta 1.10, our biggest release to date with over 546 improvements, fixes, and features. You can download it here. Since launching last February, we’ve modified, ripped, and replaced over 50% of the original codebase. Thanks to your feedback, we’ve made some great progress—but there’s still a lot more work to do. We’re excited to have you on this journey with us. Rendering transparent objects in games can be challenging. Take wine glasses for example: any graphics engineer knows that it’s time-consuming (if not downright annoying) to correctly display every single surface, and get every reflection just right—especially when those surfaces and reflections are drawn out-of-order. Order-independent Transparency solves this. We first gave you a glimpse of OIT at GDC this year in collaboration with NVIDIA Research, and now we’re happy to integrate it into Lumberyard 1.10. We’re always looking for ways to make game development easier, while also pushing the boundaries of what’s possible in real-time rendering. We can’t wait to see how you leverage the power of OIT. We’ve all dealt with jagged edges (aka jaggies) and unwanted flickering in games—in many ways, we’ve gotten used to it. But it doesn’t need to be that way. With Temporal Anti-Aliasing, you can more easily smooth out imperfections caused by real-time rendering, getting you closer to achieving film-like quality in your games. Because let’s face it: in film, you can spend hundreds of hours on just seconds of CGI effects. But in games, we need to do all of that in real-time. Together with Lumberyard’s advanced rendering technology, Temporal Anti-Aliasing will help you achieve that higher level of visual fidelity in your projects. The left side of the screen showcases the benefits of enabling Temporal Anti-Aliasing. We’ve introduced 35 improvements to component entity workflows to help speed up your iteration time. For example, you can now multi-select in the Entity Inspector (just use CTRL and SHIFT clicks), revert entities and components back to their slice defaults in one click from the context menu, enable and disable components from the Entity Outliner, and even customize your entity’s icons. We’ve also added over 50 improvements to our Cloud Gems to help you better manage your player community. New features include the ability to create new users, reset passwords, and ban players outright in just a few clicks from in the Cloud Gems Portal. Plus much more, including a brand new docking system for customizing the editor and performance improvements to the material editor. As always, let us know what you think. It’s only been 18 months, and in many ways we’re still just getting started. We can’t wait to incorporate more of your feedback and suggestions—so please keep them coming. You can learn more about Lumberyard by watching our Tutorials, visiting the community Forums, and reading through our Documentation.